Thread: How would you quilt this? You could cross-hatch the center making sure your cross-hatches go through the center blocks. Then I would do some type of meandering or leaves in the borders. The centre squares are wonderful. 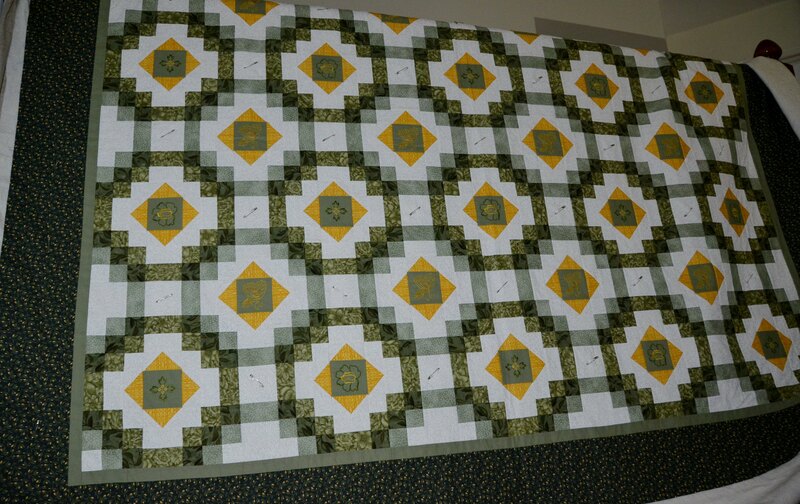 No idea about quilting but I would try if you don't want to and keep. Your mum is one very lucky lady. I don't have a clue how it needs to be quilted, but that is one gorgeous quilt top! I love that quilt. If I was doing it I think I would stitch in the ditch to give more dimension to the blocks. I am very very fond of SITD...however, for this quilt I think I would do concentric circles centered over the blocks with the motifs. It would look especially cool if you made some blocks come forward and others recede by having the "forward" ones have complete circles, and the "behind" ones have circles that look like they are going under the complete circles. I don't have a useful drawing program, so I can't draw it for you (though it is very easily drawn) but this is sort of what I mean, except that some of the circles would be complete, while others would be semicircles...rather than all being the same. It is a beautiful quilt, and will be lovely whatever you choose to do! OMGosh- what a gorgeous quilt top. I'm clueless on the quilting, though I like the idea of cross hatching that klgls suggested!! Thanks for all your wonderful compliments! I am very proud of this one and love the way it turned out. My mom's favorite color is green and since it's from her oldest daughter I know she will love whatever I do to it!! Here's the problem......my FMQ skills are REALLY at the beginner stage. I have only been quilting for about 2 years and most of the quilts I have completed have been straight stitch in the ditch although I have been practicing my meadering and stippling skills on a number of baby quilts that I have donated. I am getting much better at stippling BUT have not attempted a quilt as large as this one. I dont know is cross hatching will work - not sure how you deal with the blocks that are not square? For example, if you look between the sets of six 1" blocks you will see two strips that are 3" x 1" I'm not sure how to cross hatch something like that? See, as I said, still a beginner at all this and I'm also throwing in machine embroidery just to challenge myself in my old age!!!! 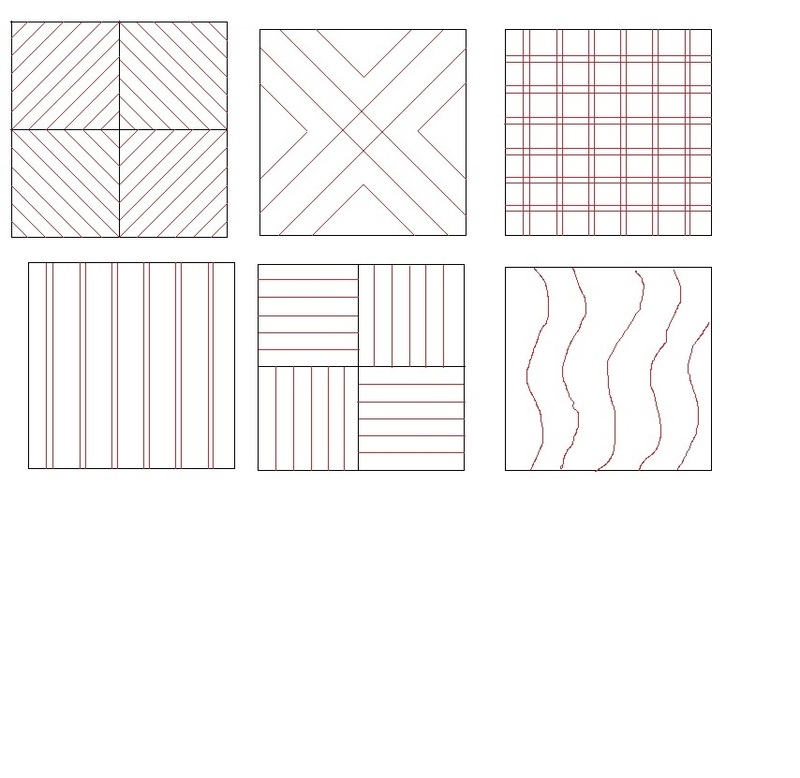 Here are few straight line designs I often use. Your quilt is really nice!! I don't know, but I know it's beautiful! Your mom is going to love this quilt. I think I would a small stipple in all the white areas and SID around everywhere else. Be sure to post a picture when you've completed this quilt. Your quilt is quite lovely, I have found straight lines to be more difficult than circles and swirls. I liked the idea of circles. You can always practice on a piece of muslin sandwiched with batting to try out something new. I like the idea of just stippling the white area and in the ditch everything else. For my very limited FMQ skills I might be able to accomplish that! Grace, for me circles are more challenging than stippling. Perhaps with more practice I will be able to be better at it. I still have 6 months to work on this.......I am way ahead of the game on this christmas gift!!! You might draw a square or two - make a photo copy - then draw you quilting with a pencil to see what looks good - then practice with a quilt sandwich. Lots of research. That is one very pretty quilt. I always have a problem deciding how to quilt, so no help here....but the quilt is beautiful. Beautiful quilt top!! I see it with some beautiful feathers, soft curvie designs of some sort..practice on paper.. then on fabric sqs. (then ask an expert FMQer to have mercy) I think straight lines are the most challenging! Really is fun to draw on quilts with sewing machine.. Your quilt is beautiful! Beautiful quilt and fabric choices! I am sure it will be lovely what ever you decide to quilt! I also quilt on my domestic machine, and If I were going to quilt this using a straight line, I think I would quilt on each side of the center black square both vertically and horizontally, that would also make a cross hatch. Or I might use a curvy stitch vertically only along each side of the center black square or along the second light grey block vertically. That's a beautiful quilt and I know your Mom will love it. Thanks for sharing. Beautiful quilt, I might go to a long armer who can really jaz it up with fancy quilting, or hand quilt. Another take on the straight lines, is using a little free motion wavy lines, done in the same manner. If you put a little curve in there it looks intentional, and still looks good. I think cross hatching in the white areas are beautiful. Old quilts often did it in pairs or even in 3's.